Jamie Roberts set out from Saltaire in West Yorkshire on 6 August 2013, to return home to Kilnsey Park in the Yorkshire Dales as part of the Park’s 35th anniversary celebrations. The walk ialso honoured an important anniversary in the history of Salts Mill, one of Yorkshire’s and the world’s greatest industrial powerhouses in Victorian times and now a cultural centre and UNESCO World Heritage site. It was 120 years ago when Jamie’s great great grandfather Sir James Roberts took over Salts Mill from the family of the founder, Sir Titus Salt and saved it from bankruptcy. As the mill’s fortunes – and those of his family – were largely built on spinning alpaca wool, Jamie decided it was a fitting tribute to start the walk with the camelid trio before they took up residence at Kilnsey Park. A weekend of celebrations took place at Kilnsey Park on 10-11th August including family activities, outdoor performances, music and local food and drink. The alpacas come from the prize-winning breeders at Carlshead Farm near Wetherby. Jamie Roberts writes: On 6th August, 2013, I walked the streets of Saltaire dressed as my great great grandfather Sir James Roberts. With three surprisingly well-behaved alpacas. We visited the Mill, Roberts Park and the statue of Sir Titus. The most entertaining bit came when my real-life alpacas came face to face with their statue in the Park. It was great to be able to pay tribute to these animals, without whom all our lives might have turned out very differently. The alpacas have now come home to live on the Kilnsey Estate, where visitors will be able to come and see them. We would love to see you here if you're ever passing. 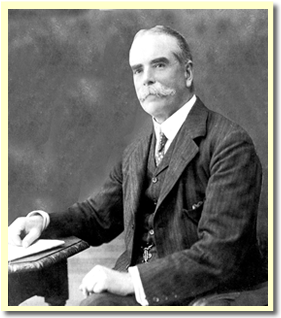 1893 - Jamie Roberts’s great great grandfather Sir James Roberts takes over Salts Mill from the family of the founder, Sir Titus Salt. Sir James, from Haworth, had originally begun working in the mill aged 11. At one time Salts Mill was the largest industrial building in the world, employing 4,000 people. 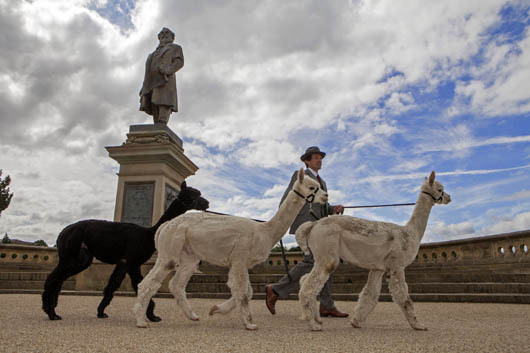 2013 – Park celebrates its 35th anniversary and welcomes alpacas to the Park. The alpacas have been sourced from prize-winning alpaca breeders at Carlshead Farm near Wetherby. Jamie is undertaking the trek to mark the Park’s 35th anniversary and the 120th anniversary of his great great grandfather Sir James Roberts saving Salts Mill from bankruptcy. As his ancestor made his fortune from alpaca wool, so Jamie will walk with alpacas that are coming home to take up residence at the family’s estate this August. Sir James Roberts, from Haworth, began working in mills aged 11, eventually rising to take over Salts Mill, considered at the time to be the largest industrial building in the world, employing 4,000 people. In 1903 Sir James erected the statue of Sir Titus Salt in what is now known as Roberts Park. The Kilnsey Estate was purchased by Sir James Roberts’s son Bertram Roberts in 1911 and four generations of the family have lived there. Kilnsey Park was established as a visitor attraction in 1978. The anniversary begins with the walk from Saltaire and will lead onto a weekend of celebrations at Kilnsey Park on 10th-11th August. The walk will follow a section of the Leeds-Liverpool Canal before continuing in the Dales. 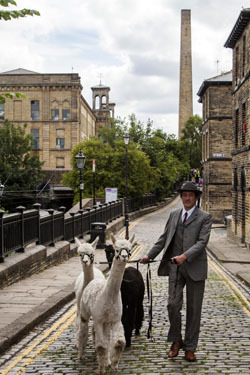 Jamie will be accompanied by the alpacas that will live at the Park visitor attraction. The alpacas have been sourced from prize-winning alpaca breeders at Carlshead Farm near Wetherby. Kilnsey Park visitor attraction is 11 miles north of Skipton in the Yorkshire Dales.